I hope that you all had a great Thanksgiving holiday, we had a fantastic long weekend together with family and friends. I absolutely love this time of year, the weather, the food, the time with loved ones and considering all these things, todays recipe is an example of that. Affectionately referred to as Grandma Peggy Salad (in my husbands family) we have it for special occasions and during the holidays – it’s a family favorite. 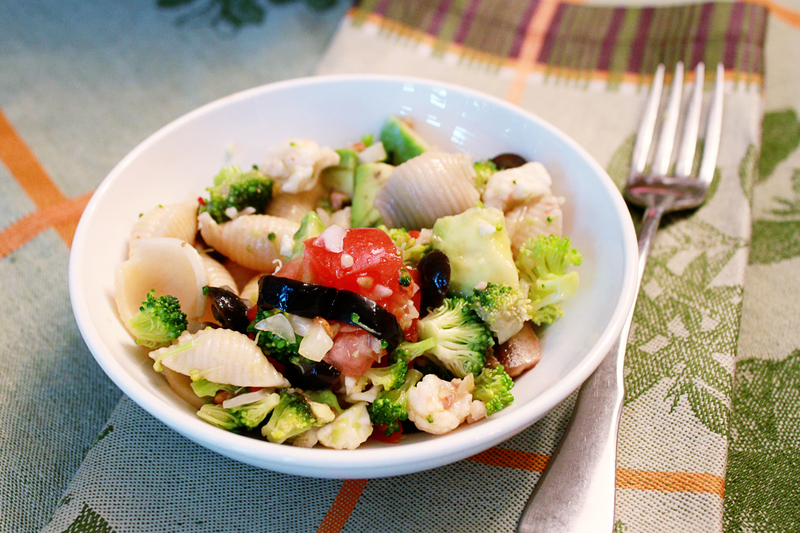 A delicious mix of pasta and fresh veggies tossed in just the right amount of dressing. It was my husbands grandmother Peggy who started this tradition and it continues on with rave reviews. The perfect side dish for any meal, I hope you’ll enjoy! Cook macaroni according to package directions. Drain. Rinse with cold water, drain well. In large bowl combine shells with the rest of ingredients except tomato and avocado. Toss with Italian dressing. Cover and chill several hours. At serving time toss adding tomato and avocado. You will love this salad, it is so delicious! This sounds and looks healthy and yummy! Thanks so much for showing us…. I could eat this as a meal! Thank you for sharing at All my Bloggy Friends. I can’t wait to see what you share this week.